When the Federal Communications Commission worked out the rules last fall to convert unused TV channels for a new long-range, wall-piercing version of Wi-Fi, Houston resident Leticia Aguirre had no way of knowing that she'd host the nation's first residential "Super Wi-Fi" hot spot. "I've wanted to have the Internet for a long time, but it's very expensive" said Aguirre, 48, a working grandmother and homeowner who's never had a reliable Internet connection at her home. Thanks to a partnership between Rice University wireless communications researchers and Houston nonprofit Technology For All (TFA), Aguirre's home became a Super Wi-Fi hot spot this month. TFA and Rice plan to add more Super Wi-Fi links in Aguirre's neighborhood in coming months, and with companies racing to develop Super Wi-Fi technology, the type of network that Rice and TFA are deploying for 3,000 residents in East Houston could become a common fixture in cities and rural areas in the coming decade. "We have federal support from the National Science Foundation to develop this technology in an open-source way," said Rice's Edward Knightly, professor in electrical and computer engineering, whose research group built the prototype Super Wi-Fi equipment that Aguirre is using. "Ultimately, we want to develop this technology in such a way that it benefits the most people by accessing the right spectrum for the right users. Having Mrs. Aguirre as our first user really shows the potential benefits for people who've been underserved with traditional broadband." 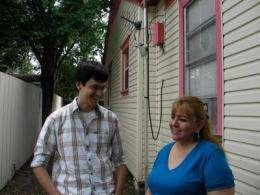 When Knightly's research group teamed up with TFA to launch a free community broadband Wi-Fi network in the East Houston neighborhood of Pecan Park in 2004, Aguirre was one of the first homeowners to agree to host a Wi-Fi hot spot. That network, TFA-Wireless, now serves a three-square-mile area. But Aguirre, who lives at the edge of the network, has never received a good Wi-Fi signal at her home. Aguirre said she got so frustrated with the traditional Wi-Fi that she considered asking TFA to remove the Wi-Fi antenna from her home. "But I need the Internet to see that my paychecks have been deposited and to do other things," she said. "When they called me to see if I wanted to try this, it was an answer to my prayers." Aguirre said she is looking forward to using email and Skype to stay in touch with friends and family, including her three children and her five-year-old grandson, and to watching religious videos online and learning more about how a computer can help her in her daily life. The original TFA-Wireless network was designed as a test bed for urban "multihop" Wi-Fi technology. In late 2010, just as the FCC established its rules for Super Wi-Fi, Knightly's team received a new grant from the National Science Foundation to incorporate Super Wi-Fi into the TFA-Wireless network. "Mrs. Aguirre was the perfect user for this because of the problems we had serving her with traditional Wi-Fi," said Ryan Guerra, a Rice graduate student who spent several months creating the Super Wi-Fi equipment that TFA-Wireless installed at Aguirre's home. To users, the new hot spot looks like any other; it can be accessed with any Wi-Fi device. Behind the scenes, the network uses "dynamic spectrum access" to automatically shift between traditional Wi-Fi and unused UHF digital TV channels to provide the best possible coverage. "This Super Wi-Fi technology is a quantum leap in terms of the end-user experience that it will allow us to provide to users on our network," said Will Reed, president and CEO of TFA. "The fact that this is happening in a community-broadband setting is significant as well, because this technology has a real potential to break down barriers and bring broadband to underserved urban and rural communities," said Reed, who has served both as an alternate member of the FCC Consumer Advisory Committee and as a member of the FCC Consumer Advisory Committee Working Group on Rural and Underserved Populations. Other Rice Networks Group members who participated in the project include Rice graduate student Oscar Bejarano, Rice undergraduates Subhash Doshi and George Chen, and visiting undergraduate Christopher Holmes from Georgia Tech. Behind the scenes, the network uses "dynamic spectrum access" to automatically shift between traditional Wi-Fi and unused UHF digital TV channels to provide the best possible coverage. Since user's WiFi adapters almost certainly can't use the UHF spectrum, I'm assuming they are using that band for the backhaul. This makes sense, since if you are only using WiFi, then you are using MESH or WDS, which have inherent bandwidth limitations that get 2x worse for every hop away from the last node of the backbone. Still, they must be using dual radios, so the only advantage to UHF is interference avoidance, which is significant. I wonder what about the initializing outgoing request for a web page -- is it being transmitted on these same TV signals -- i would think not right? how is uploading handled is my basic question -- is this like satellite internet where you use a phone connection to upload and download from a signal. It just seems unreasonable that we are now putting the transmission capability of a an old tv spectrum frequency in the hands of every civilian. Agreed. No existing WiFi adapter would be compatible. It would require UHF capabilities to be added to all future computers. This is unnecessary. WiFi is perfectly fine for small buildings and single family homes. The UHF would only be used to improve the service to the residence or business. I think the backhaul radios might be capable of auto-switching between UHF and WiFi freqs depending on the noise floor/interference. I don't see why any client would need UHF. I think it's kinda like how normal WISPs bring service to their customers. Depending on many factors, they might use WiMAX (3.7 GHz), 5GHz, or 2.4GHz, or even 900 MHz. That's just from the tower to the house. From tower to tower (backhaul), they might use 10GHz licensed freqs that should have no interference issues. In urban areas, those licenced bands might be all used up, and with UHF now available, I can see why they are now testings its effectiveness. The only WiMAX products I have used are Motorola and Airspan. The Moto I have used is low power, and affordable Airspan base stations are limited to ~15-18 Mbps, depending on packets/sec. UHF radios, I assume, are much cheaper. I don't think it's about power or throughput capacity, but about usable spectrum. In urban areas, you can never have enough. WiMax is designed for licensed spectrum applications, but theoretically there is no reason that one couldn't use a WiMax MAC and PHY to utilize unused TV channels. Unused TV channels, on the other hand, are open to UNlicensed users, so long as their equipment is certified by the FCC. Ubiquiti Networks already makes WiFi cards that operate at 5.8 GHz, 2.4 GHz, 900 MHz, and 700 MHz, so it isn't a huge conceptual leap to assume that WiFi cards operating in the UHF band (512-698 MHz) could be just around the corner. The FCC had no idea what would happen when they opened up the 2.4/5.8 GHz ISM bands to unlicensed users, and we saw a huge explosion in wireless devices (WiFi, Bluetooth, ZigBee, baby monitors, remote wireless video, keyboard, mice, sensor networks.... the list goes on and on). Verizon and AT&T spent billions on the 700 MHz Block C spectrum for LTE buildout, but now anyone can use similar frequencies for free.